In retrospect I didn't really maximise my opportunities today or perhaps the trout were being more circumspect than usual. Of the seven fish I caught I actually felt only two takes one or which was the first which hit the fly on the drop. There were a further 5 definite takes that I either bumped or missed altogether and one of these took the indicator a good 6" upwind. Not one of those registered in the hand. A very few fish rose, but there was one I did see and was able to cast to quickly. At the time I was using a fairly heavy point fly so I didn't hold out much hope. but the indicator went after about 15 seconds so I guess the fish went back to its previous depth and there in front of it was a buzzer! Sans indicator my tally today would have been two definites and one probable. I use the foam indicator most of the time when fishing a floating line, it definitely gives an edge. In the days when we fished Hanningfield for the giant trout under the cages we used the wool moustache method which I think Wylye's method might be based on. For Farmoor when using the long leader/deep nymph method my indicators are made from egg yarn & are trimmed to be able to go through the rod rings. No problems with holding up 3mm tungstens when necessary. I usually have a few made up and already waterproofed with Watershed. A dollop of Gink finishes it off and it'll float all day. The New Zealand method is great for small stillwaters when the fish are taking static buzzers only a few feet down and also for rivers of the chalkstream type that are not too turbulent. It is useless in Austria as it gets sucked under in seconds. Then the Fish Pimp type are more effective. The last 4 trips - 3 to Farmoor and 1 to Chew - have resulted in 33 fish. Without the indicator that would have been 12 as those were the only takes I actually felt. Hopefully it won't be too long before the fish are more active and the takes become a lot more positive. Paul and I had a cracking day on No 2 today. The catch rate from the bank was steady but needed constant attention because takes were gentle and easily missed. The point fly was changed around through out the day as the fished seemed to be moving up and down in the water column, I went from a heavy buzzer on the point all the way through to the buoyant point washing line set up. The two most consistent methods for me was swinging buzzers on the wind and straight line nymphing. It was the first fly fishing trip for Paul in three years and he had his four fish limit and I lost count at double figures, all the fish were in great condition and the ones Paul dispatched were full of buzzers. Wylye was in front of us on a boat and we swapped information through out the day via the mobile phone. The water levels are on full and the clarity was gin clear on the west bank, Its well worth the trip at the moment. I am editing a video of the last two sessions buzzer fishing so watch this space to see the fish and flies. As Peter has said I was out in a boat yesterday on F2. I would rather have fished the bank, but the chap I was with wanted a boat and as he paid for it there was no option. The bank definitely out-fished the boats today as we struggled to put four fish in the net. I thought we were in for a good one as I had two good takes on the first drift but after that it just died. Fish rose sporadically but showed little interest in anything. Even dropping the flies accurately across the path of a fish which normally is all but certain of a response at Farmoor gained nothing. The Three I had just smashed the buzzers "out of the blue". This is my latest effort on YouTube, my main reason for doing these vids is to learn new skills. Let me know what you think. It's because a lot of fish cruise those two soft algal silt beds a few yards out. This is home to bloodworms and then the buzzers do not have so far to rise up to the surface. Easier pickings for the trout. It has been like that ever since I first fished Farmoor. That ten yard out, ten foot deep area has always been a consistent producer once the trout have moved in from the winter grounds in the deeps. Fished F2 yesterday , lots of fish moving , but not wanting dries appeared to be on buzzers just below the surface . I fished a very small booby on the point with two size 14 black buzzers on droppers . All takes came on counting down about 10 -20 seconds depending on the breeze with the fish appearing to move up and down , when very calm the takes were higher in the water . What was a good day turned a little sour when I somehow locked my car keys in the boot , AA to the rescue . Home a little later than expected , trout for supper ( not tea ) with a few glasses of wine ! Trip across to Farmoor this afternoon - high expectation after some good reports. Greeted with a flat calm and Mark saying things a little tougher. Motored around to NW corner passing loads of banksmen mostly congregated around SE corner and set up my Chub chair on the causeway fishing into F2.. Floating line with glue buzzer on point and red Holo db on dropper. Nice long cast and settled into my chair and was just fiddling with my polaroids when the line shot out and fish on. Took another 2 fish on the buzzer set up before things slowed down. Was joined by a couple of guys one of which took 3 fish in short order out of my back pocket (well 20yds further along the causeway). He helpfully said he had taken them on damsel nymphs so one went on the point. Took 3 more fish and lost a couple together with quite a few jags, they might have been nipping the tail of the damsel. All fish in good nick and fighting fit. 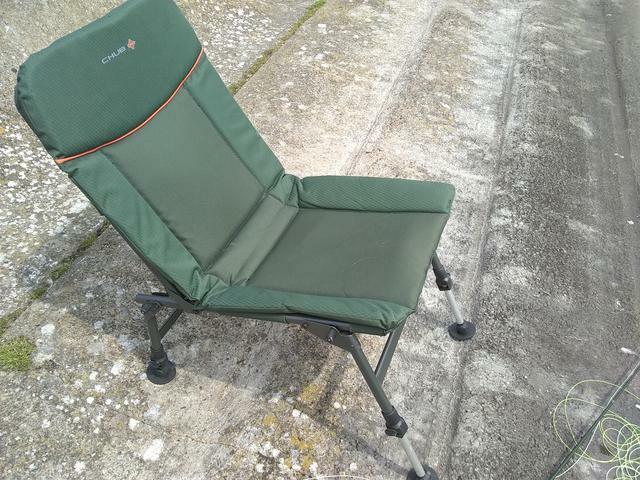 Water quality excellent and ressie just about full - can't recommend the Chub chair highly enough. The adjustable legs give a perfect seating position and takes the strain away from standing on the sloping concrete. I know you can Stand on the road to cast but to my mind you are too far back from the water and then you have to hop over the rim if you catch. Would have been ok some years back but with the amount of chromium and cobalt in my hips and knees I ain't that stable. A good afternoon on a c&r ticket which at £17 is good value. Of to Cornwall in the morning for 10 days but hope to go afloat on my return. tenet has made an interesting observation. I see quite a lot of Farmoor anglers standing up on top of the wave wall. Crystal clear water in front of them and often calm or nearly so as they have to fish with the wind behind them. They seem to miss the point that trout have got eyes and even though they are farm-reared I very much doubt that that upbringing has totally eradicated at least ten millennia of being aware that danger comes from above as much, or more, than it does from below. Therefore, some great "bear" waving his arms around ten feet above the water is going to send out all sorts of alarm signals to the fish. Next point. When standing on the wall there is inevitably going to be a lot of "sag" in the line between rod tip and the water several feet below - gravity and all that. So, a fish has to move quite a long way before a take is registered. Some will, many won't. I avoid those anglers like the plague. If any come near I move. They can b*gger up their own fishing to their heart's delight, but I'm damned if they are going to b*gger up mine! I always try to get away from others on the bank but if you start catching the bank around you starts to fill up. On Tuesday when we started to catch a few it was not long before the motorcade started to come around to car park 3. In full agreement re standing on the wall and waving, some of it is also due I think to a poor/low back cast catching the road and grass.